Home Blog Page Big Uncategorised Rainy day gardening activities for all the family. Rainy day gardening activities for all the family. As the winter draws in, the desire to head outside in the fresh air goes out of the window. But that doesn’t mean that you must give up all hope of your children being interested in gardening. To help keep their green fingers, well green, we have put together some rainy-day gardening based activities that you can do from the warmth and comfort of inside your own home. Growing your own herbs is incredibly rewarding, however, it can be a bit tricky to remember which sprouts are which. Why not turn this issue into a craft activity for your kids? All you need to do is fine some good sized, flat pebbles and give them a lick of paint (we recommend acrylic paint). It may take a few coats, so we suggest this project is spread over a weekend. 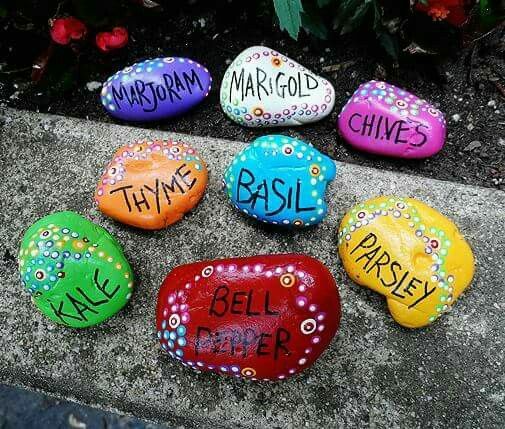 Once you have the pebble completely covered in vibrant paint, you can use a marker pen to outline the letters and white paint to fill them in, making clear labels for all your herbs. Once varnished, these labels can live perfectly happy outside. Take the sock and pop the grass seed right down the bottom in the toe section. After this you will need to fill the rest of the sock with sawdust (or even some stuffing if you have that lying around) and use the stuffing to fashion a nose on the front of the sock, securing that, and the top of the sock, in place with elastic bands. The kids should then pop some googly eyes on the sock. You may want to secure them with glue if you are worried that they will come off. Especially since you will then to make sure that you soak the sock so that it is nice and wet. 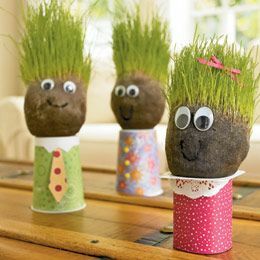 Your grass head will then need to sit in a warm place, that gets sunshine (we recommend the windowsill) on the yoghurt pot full of water. Encourage your children to water, and check, their grass head regularly. Before long, it will sport a beautiful head of hair that they can then trim! The winter isn’t easy for birds, finding food can be tricky, so why not teach your children all about how to care for our local wildlife, and give them something to do on a rainy day too? 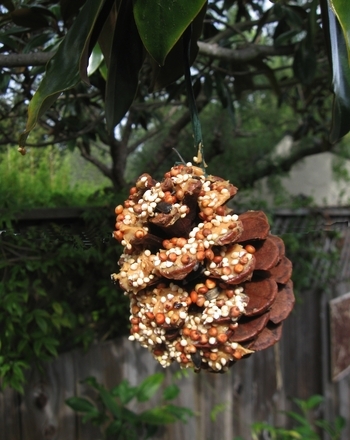 Use the garden wire around the top of each of the pine cones, making a loop. This means that the kids can hold the feeder with ease and then hang them up. The lard should be combined with wild bird seed and using spoons or lolly sticks you can push the mixture into all the cracks and nooks on the pine cone. Once it is covered in the mixture you can decorate with your chosen berries and hey presto, it can be hung outside ready for the birds to get some much needed food! Hopefully these have given you some great ideas for rainy days, keeping your kids entertained and you from pulling your hair out! Previous Post	Why composting is great for your garden. Next Post	Worried about snakes in your garden?